Applying for business credit cards is a great way to earn more miles and points than you already do, but many people don’t apply for business cards because they incorrectly believe they don’t qualify. You don’t need to have employees, nor does your business need to be profitable. You can use your social security number instead of an EIN on the application. Your business doesn’t even need to have it’s own name or separate address from your personal one! Sell things on Etsy? Ebay? Bake sales? Yard sales? These are legitimate businesses to open a business credit card for. Last year I opened a Chase Marriott Rewards Premier Business Credit Card under my own name and social (not with a business name nor EIN) for the purpose of organizing spending involved with selling items on ebay. Learn more in How to Get Approved for Business Credit Cards. And just because you have a consumer version of a credit card does not mean you can’t get the business version of the same card. If a co-branded card is available for consumers and businesses, they are generally considered separate products in terms of card eligibility. For example, if you have the Delta Gold Amex card–the consumer version–you can still open and receive the bonus on a Delta Gold Business Amex. Without further ado, here are what I think are ten of the most lucrative business credit cards/offers on the market right now. The Chase Ink Business Preferred Credit Card offers 80,000 Ultimate Rewards after spending $5,000 in the first three months. Ultimate Rewards transfer 1:1 to United, British Airways, Singapore, Korean, Southwest, Virgin Atlantic, Hyatt, and more. The Ink Preferred earns 3x points on travel; shipping; internet, cable, and phone services; and search engine or social network advertising (on the first $150,000 spent annually), and 1x points on everything else. You’ll also get up to $600 in coverage per claim in cell phone protection against theft or damage for you and your employees, as long as you pay that cell’s bill with the Ink Preferred. For only $95 a year, this business card offers solid benefits and return on spending as a stand-alone card. I think it’s the best option for the price. The Chase Ink Business Cash Credit Card technically comes with a $500 cash back sign up bonus for spending $3,000 within the first three months, but what you are actually earning is 50,000 Ultimate Reward points. They are a different kind of point than what’s earned by the Chase Sapphire Reserve or Ink Business Preferred. I said technically above because it is marketed as a cash back card. But the Ultimate Reward points it earns don’t have to be redeemed for 1 cent each, as most card advertisements lead you to believe. If you have a Chase Sapphire Preferred, Sapphire Reserve, or Ink Business Preferred, you can transfer the 50k Ink Business Cash Ultimate Rewards to one of those accounts to turn them into the kind of Ultimate Rewards earned by the respective account… that are transferrable to nine airline or three hotel loyalty programs for outsized value on international/premium cabin award flights and expensive hotel rooms. This increases their value to somewhere around 2 cents each (meaning 50k Ultimate Rewards would be worth around $1,000 instead of $500). Alternatively, moving them to your Sapphire Reserve card also means you can redeem the points for 1.5 cents each on cash flights through the Chase travel portal, which is often the better deal (compared to turning them into airline miles) for domestic flights. 5 Ultimate Reward points per dollar on the first $25,000 in combined purchases at office supply stores and on cellular phone, landline, internet and cable TV services. And you get all of this for no annual fee, ever. Just don’t charge foreign purchases on it as you’ll get hit with fees. If you have a Sapphire Reserve, Preferred, or Ink Business Preferred, then I highly recommend scooping up this card for it’s (higher than usual) 50k bonus points, and the earning potential with that 5x category bonus points in business specific expenses. Even if you don’t have one of those other Chase cards, 5x points redeemed as 5 cents cash back from cell phone, landline, internet, and cable TV services is a fantastic return. The Chase Ink Business Unlimited Card offers a sign up bonus of $500 cash back for spending $3,000 within three months of account opening. Just like the Ink Business Cash, however, if you also hold a Sapphire Reserve, Preferred, or Ink Business Preferred, then you can transfer those Ultimate rewards earned by the Ink Business Unlimited to your other Chase account and they magically turn into the kind of Ultimate Rewards that can be transferred to airline loyalty programs, increasing their value dramatically. What’s also pretty appealing about this card, which is the business counterpart to Chase’s Freedom Unlimited consumer card, is that it will earn 1.5 points on ALL purchases with no cap. That’s a great return (especially if you can transfer those Ultimate Rewards to a more valuable account) for no annual fee. This card charges foreign transaction fees so it won’t be a good option to use when traveling. While not unusual for business cards, the minimum spending requirement on the Business Platinum from American Express is rather high–$10,000 within three months of opening the card will get you 50,000 Membership Reward points, and an additional $10,000 in spend will earn you an additional 25k Membership Reward points within the same three month period. A 75k points bonus is a big chunk of rewards though. I don’t recommend manufacturing spend on Amex cards, as they are known for clawing back points for that kind of behavior. If you can manage the spending organically, you’ll be getting about a 9.5% return on spend (using my valuation of Membership Rewards which is 2 cents each). The card comes with many of the same valuable perks that the personal Platinum does, like $200 in airline incidental fee credits every cardmember year (but not up to $200 in Uber credit like the Platinum Card from American Express). 5x points on airfare and prepaid hotels booked through the Amex travel portal and 35% points rebate when paying with Membership Rewards for air travel booked through the Amex travel portal. The rebate applies to one designated airline when buying economy tickets, but any airline when purchasing premium cabin tickets. $100 hotel credit for qualifying hotels booked through Amex Travel. The annual fee is $595. No foreign transaction fees are collected. The draw for the majority of the credit cards on this list are their big sign-up bonuses. That’s not the case with the Blue Business Plus Credit Card from American Express which does not currently come with an intro bonus. The fact that it earns 2 Membership Reward points per dollar spent on all everyday business purchases makes it the best small business credit card for everyday spending available. Note that the 2 points per dollar earned applies to the first $50,000 in purchases per year, and you’ll earn 1 point per dollar thereafter. Since I value Membership Reward points at 2 cents each, that’s like getting a 4% return on everything–up to the first $50,000 in spending per year. If you have lots of spending power that wouldn’t otherwise earn a higher category bonus on another card, then the Blue Business Plus Credit Card from American Express is a fantastic option for you. This card is a heavy-hitter for long-term value, especially because it has no annual fee! Just don’t use it abroad or you’ll incur foreign transaction fees. The annual fee of $99 is waived the first year. The link to apply for this card has been moved to the top of the website, under the drop-down menu Top Credit Cards. The Capital One Spark Miles for Business Card comes with 50,000 “miles”–worth $500 towards travel purchases– after spending $5,000 on the card in the first three months. 1 cent each toward any travel expense. The 50k bonus miles are worth $500 in travel credit if you decide to redeem Spark miles this way. Transfer to 12 airline partners at a rate of 2 Spark miles to 1.5 airline miles, like Flying Blue, Aeroplan, Etihad Guest, and Avianca LifeMiles to redeem as airline miles. You’ll earn 2 Spark miles per dollar spent on everything you charge to the card. The Capital One Spark Miles for Business does not charge foreign transaction fees and has a $95 annual fee that is waived the first year. 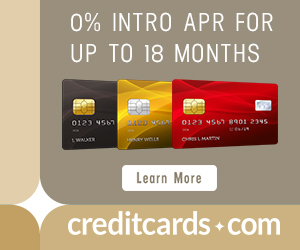 The Marriott Bonvoy Business American Express Card Credit Card comes with 75,000 bonus points for spending $3,000 within three months of account opening. The points can be used for free nights at Marriott Bonvoy properties, or transferred to 45 different airline loyalty programs…practically all in existence. Points transfer to airline partners 3:1, and you get 5k bonus miles for each increment of 60k points transferred, so 100k Marriott Rewards = 38,000 of almost any airline mile. While 38k miles doesn’t sound like a great bonus, the fact that you can top off nearly any program you’d need to for an award is valuable. 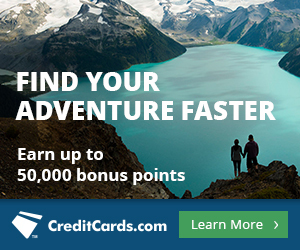 Category bonuses include 6 points per dollar spent at Marriott Bonvoy properties, 4 points per dollar spent at U.S. restaurants, U.S. gas stations, wireless telephone services purchased directly from U.S. service providers, and on U.S. purchases for shipping, and 2 points per dollar on all other eligible purchases. This card has a $125/year annual fee. The Southwest Rapid Rewards Premier Business Credit Card comes with 60,000 Rapid Rewards for spending $3,000 within three months of account opening. If you live and travel often to destinations served by Southwest, the Companion Pass should be on your radar as it is one of the best deals in travel. It allows you to designate a companion who flies for just the taxes on every Southwest flight you fly. That’s $5.60 each way within the United States and a bit more on Southwest’s international flights. You qualify for a Companion Pass by earning 110,000 Southwest Rapid Rewards from credit cards during a calendar year, and you keep it for that calendar year you earned it in as well as the following one. The fastest way to earn the 110k qualifying points is via the sign up bonuses from one business Southwest card + one personal Southwest card. There are are three consumer Southwest cards and all of them come currently come with 40k sign up bonuses. Read more about the top option for avid Southwest flyers in our Top 10 Personal Credit Cards list. I love Southwest because of its two free checked bags, no change or cancellation fees, and efficient boarding process. Southwest Rapid Rewards can be very valuable for domestic redemptions/redemptions to Mexico or the Caribbean if you can book it far enough ahead of time (award prices are based on the cash price of the ticket, unlike most award pricing schemes that are region based). This card has a $99 annual fee that is not waived the first year. Before rushing to sign up for new cards, remember to take into account that some miles are better than others for getting to specific destinations–not to mention issuing bank rules concerning eligibility if you’ve had rewards cards in the past. If you need help deciding which card is the right one for you, try our Free Credit Card Consultation Service. We’re happy to help guide you in the right direction towards effectively and efficiently collecting the appropriate rewards. Need help redeeming your miles efficiently? Try our Award Booking Service. You send us your goal and current balances, and we do the work making sure your miles are stretched just as far as possible. Sarah, I think the Blue Business Plus is giving 10K right now. I got the card between the 20K and 10K offers. Sometimes you win, sometimes you lose. The Bus. Plat only gives 1.5x, yet this free card gives 2x. Time to pay taxes soon, so which one will I choose. Hey Bryon, are you sure that’s not a targeted offer you’re seeing within your Amex account online? I do not see a sign up bonus for the public offer. I don’t know the time span of ur card BUT I have called on cards and the bank gave me the higher points . Taxes are a No Hassle way to hit min. BUT no one will give me a card To many Look sees on my credit .I’ll lay low for a year. You state that the Amex SPG Business card gets “5 points per dollar spent at SPG properties.” You sure about that? That line was confusing so I changed it–thanks for pointing that out. What I meant was that you can “earn up to 5 points per for each dollar of eligible purchases at participating SPG® hotels‡ – that’s 2 Starpoints for which you may be eligible as a Card Member in addition to the 2 or 3 Starpoints for which you may be eligible as an SPG member”… you’ll get 2 points per dollar spent on SPG properties from Amex, and you’ll get an additional 2 points per dollar spent on SPG properties just for being an SPG member. So even without status you’ll earn 4x. If you have status, you’d earn 3 points per dollar spent on SPG properties, making your grand total 5x if you put the spending on the Amex card. But the additional 2 or 3 points for being an SPG member/elite member you will earn regardless of whether you have this credit card. Is it ok to sign up for a credit card under your employer’s business name if they don’t offer you a “company card” or is it better to just sign up under your own name and side business? I would not open a card under your employer’s business name or EIN unless you have express permission. Just use your own social and put your business down as a sole proprietorship. You cannot sign up for a business card as an employee. Only as an owner/director. Right. To clarify my prior response when I said “Just use your own social and put your business down as a sole proprietorship”, I meant your side business (as you mentioned you had one in your prior comment). Not your boss’ business. Is your number 1 choice “The Ink Preferred . . .business card…” the same card as the “. . . Ink Business Preferred. . .” card discussed in your number 2 and 3 choices as a transfer option? Overall it’s a good analyses of current offers. There is a discrepancy in #2 (Ink Business Cash): 50K point offer later described as 30K offer. With Chase 5/24 rule they supposedly can see all your Chase business cards as well as personal, so it’s harder to get under the 5 number. Otherwise the offers are really nice, plus cards offer decent benefits to hold on to them. Hi Sarah, what ever happened to Scott Grimmer? He’s not involved with MileValue anymore, I took over in the beginning of the year. He’s pursuing other endeavors and is currently in Russia for the World Cup. Hi Sarah, anything new? These posts are just recycled and refreshed. How about some new content? Hi Todd, I realize there has been less content lately. Definitely focusing on ramping that back up in 2019! Any style of content in particular that you appreciate? Hi. Which business cc’s don’t show on your credit report. Barclay’s business cc’s seem to show up on mine. I have read that occasionally Barclay’s business cards will show up on your personal credit report. Usually they do not. The only other bank’s business cards that show up on personal credit reports (consistently) is Capital One. Sarah, how would you respond to the first certification on all chase applications that the card must only be used for business purchases and not personal spending.It would seem with the high minimums and a small etsy,ebay business you wouldm’t have enough spend. I would say that yes, indeed, that is what the terms say. I would also say that most people I know use business credit cards for all kinds of purchases without issue. But of course, that is anecdotal. I use my INK for everything .Just remember a bus. card has LESS safe guards so u may have to pay out if u get ripped off. Deleted. That was old info pertaining to a prior bonus.